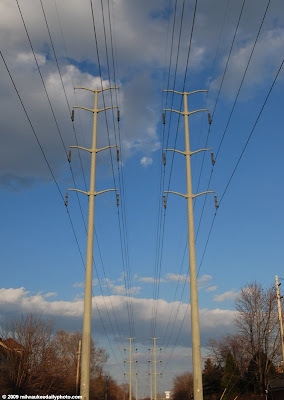 These powerlines run parallel to the freeway from around 27th Street out to Wauwatosa (the poles in the foreground are near 74th Street, between Bluemound and the freeway). My mother grew up near here, and she says that this area used to be where the streetcars ran from downtown out to the western suburbs and beyond. We had light rail fifty or more years ago... perhaps we could figure out a way to reclaim the trolley tracks and make it work again?